Hello Ian, Yes, it is possible that your birds may be suffering from quill mites. Remember, quill mites and some other types of mites are not blood suckers, so S76 in the drinking water will not be effective. I suggest that you try mixing the S76 at drinking water strength and allowing one or 2 of your birds to bathe in it. Assess the results. If there is a positive result, then let them all bathe in it. If your birds do not like bathing on their own, then gently mist them with the S76 water. This could also be a thrush problem, so adding the KD Water Cleanser to the bath and drinking water could also be helpful. shelly from hendersonville, nc asks: I recently aquired a group of finches from a pet store that was going bankrupt. 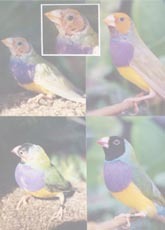 In the group, there is a male gouldian, 2 societies and several zebra finches. They are all housed in a large cage together. I have noticed that the color in the gouldian is faded and looks like he is losing feathers. I have never witnessed the other birds picking on him, but have not ruled that out as a possibility. Do you suggest separating him or do typically mixed flocks do OK? Hello Shelly, I suspect that the faded color on your new Gouldian is a result of inadequate nutrition in this last year since his yearly molt. The birds that you have mentioned should have no problem living in a colony together. Hello Denise, Insufficient iodine may sometimes be the cause of head feather loss, but most times it is caused because birds are breeding "out of season". By this I mean that they have not been allowed a proper time period to completely molt each year with adequate nutrition. ROCCO CICIRELLO from STATEN ISLAND NEW YORK asks: hello, i have a molting red factor canary,i added one half tea spoon of cantaxithin into one half pound of orlux red factor egg food. do you think this sufficient, or to much? they say what they don't need they excrete.is this correct? thank you. Richard Norwood from Columbia, SC asks: I have Society Finches that have some feather loss that seems permanent. They lose feathers on their upper chest, the nape of their neck, and over their shoulders. The loss is in patches. I have used S76 and I have sprayed for mites with no improvement. Any ideas? Thanks. sue lloyd from USA - North East asks: Wondering what would cause Canarys to go into a soft molt. This - of course ruins any hope of breeding. They seem to just finish a molt and start another. Could this be related to a medical problem? I am not the only one seeing this in my birdroom. Reading your book on Canary Health and wondering if an antibiotic treatment would be a good idea. Would you recommend Baytril? When would be a good time of year to treat the entire flock with baytril? After the summer molt - or just before Breeding season? andreabonoldi from southborugh, ma asks: What does it mean if both of the side wings are dropped slighty and not exactly in line with the back feathers. Kim from Iowa asks: I have a pair of redhead normal Gouldians. They have lost their head feathers and they have not returned. What is their problem and what can I do to assist them in regaining their head feathers? Sandra DeSante from Philadelphia, PA US asks: One more question. After molting my male orange-cheeked waxbill ended up with one white tail feather. How did this happen? Will it turn dark gray again with his next molt or will it stay white? Jim Beverly from Bristol, TN asks: I purchased a Swainsons Lory in Nov 05. It started picking its feathers and appears to have some type of parasite. We have had it to the vet several times with no cure yet. Tried ivermectin and now cefadrops. The bird has no feathers on his chest and left leg and now starting down his back. There are yellow scales on its neck and leg and back where the feathers used to be. Any suggestions. Sybil Wyatt from Baltimore asks: Our male eclectus is plucking his feathers. The owner of the store where we bought him three years ago recommended acquiring a small bird--perhaps a finch--to keep in a separate cage in our parrot's room. 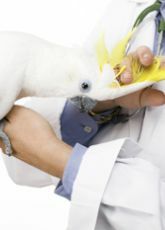 She thinks the diversion might improve our parrot's mental health and reduce his plucking. What do you think? Mona Lilly from rockton , IL asks: My baby gouldians are now 8 months old. One of them is still green and the other one has almost changed completely except the black head is spotted. Three week ago I started them on vitimins program of yours. Will this help them change colors. They both sing and seem very healthy. We live in the midwest and I keep the temperature at 74 degrees and the humidity of 40%. Is there anything else I can do? I say this as a joke, they were raised by Zebras and they have taken on thier personality. It seems like they want to stay green. Stan Weiner from Westlake Village, CA asks: I have a new Cordon Bleu male that is about 9 months old. I have had the female for almost a year. Her last mate died recently, they never "mated". It appears that she is pecking, not aggressively, at the back of his head. He has a bald spot now. This just started and we've had him for about 2 weeks. Three questions: Will the feathers grow back and what to do about the pecking? Finally, why is it happening? Tom from Jerusalem asks: Hello Again........... I have a canary that has been molting for about five months nonstop. It does sing, but weakly. I do not have it in a draft, and I feed it plenty of vitamins and make sure that it is getting all its needs, but I can't figure out why it is still molting. I have several other birds in the same place and they get the same treatment, yet they seem fine. Plus, when does the canary breeding season begin? Hello Leo, Your finches are probably experiencing an environmental change molt. This can happen when you newly acquire them because their temps and humidity can sometimes be different than where they came from. I would take all the nesting material away until this molt is finished. It is very stressful and energy consuming to molt and try to raise chicks at the same time. The parents will run out of energy and then possibly abandon the chicks. Reva Wamsley from Yuma AZ asks: We have a pair of Gouldian finches that are going through their first molt. They are both puffed up but the male is really puffed up. He acts fine, he's eating and active. Is this a normal part of molting? We just started giving them Feather Up. Hello Reva, Whenever birds puff up during their molt, that is a sign that all isn't going well. Molting is very stressful on them and it requires a lot of energy and perfect nutrition. The Feather-Up is a start in the right direction as long as they are eating something moist that you can sprinkle it onto. Another thing that you can offer them is some NV Powder for about a week. This is an electrolyte, glucose and vitamin supplement that is added to their drinking water that will give them a quick boost of energy to help them through this molt. 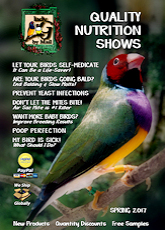 Courtney from Australia asks: I wrote to you last year about my female Gouldian going bald on the top of her head. Over the summer she grew her feathers back and looked really good. However she is beginning to show signs of loosing them again. She has begun to loose feathers around her beak and eyes. Is there a way of preventing this from happening again. We keep the birds inside at night and when it is cold, but have them outside as much as we can. Does ducting heating effect the birds in any way? They get a balanced diet and food/water is changed daily. Thank-you for your time. Ivy from England asks: Hello Doctor Rob! I am a birdkeeper living in Suffolk, England. I have two budgies, seven red factor canaries and two Gouldian Finches, all kept indoors in separate cages. We've had the Gouldians since last year and they are about three years old. I am becoming worried about them as the female has been losing feathers at the back of her head, along the edge of her mask (both birds are normal red headed Gouldians). I thought this is because the male has been trying to mate with her for the last few months and he pecks her head during his attempts. Now the male has lost a lot of red feathers around his face and around the edge of the mask- I can see his ears. Both birds even have small bald patches. Is this a normal moult for the UK? I have been giving all of the birds vitamins and exercise. I would appreciate any advice. Jacqueline Forte from Florida asks: One of my 4 ringnecks has a large bald patch around his left ear. I am assuming this is mites. I have read many of your responses stating to use S76. I am wondering if you ever recommend Diatomaceous Earth as treatment. I use this on my chickens outside and they do very well. I have also used Frontline on them and it works too! 1 drop on a bantam. I of course am terrified to use that on my indoor birds but am convinced that the DE can't do any harm. What are your thoughts and if you think it is a good idea would you reccommend dusting them or having them eat it? Thanks in advance for your time. Jeff & Lavonne Bell from Illinois asks: We have lady gouldian finches. Our finches appearance is bad. They are always picking at themselves all the time and look as if they are in a full time molt. We took a couple of the finches to the vet and he said they are healthy. They don't look healthy and I'm debating this vets expertise. He checked them for lice and mites and found none. He said maybe they are stressed and to give them more meat, as to give them our left over meatloaf or whatever. The younger of our gouldians breaths hard,eyes always look tired, and appears puffy and always picking at himself as do the rest of the gouldians.They are offered a variety of the best of foods, including live food. Any ideas ??? Our birds are kept in a plexiglass aviary. I use corn cob and natural pine bedding on the floor which is changed at least every 10-14 days. Their food dishes are cleaned daily as is a fresh supply of vitamin supplemented water. They eat a balance of seed, fly larvae, fresh veg's, hard boiled eggs, millet, on a daily basis. I feel that their diet is not an issue but the Vet suggested they may be stressed and to feed them whatever type of meat we were eating, they may be lacking protein. I have tried this but the gouldians don't seam to care for it. I had also heard to get the wax bills out of the aviary, which we did with the exception of one orange cheek. We currently have a pair of Societies that have just fostered a Gouldian egg and he/she has just left the nest this past week and seems in excellent health. The only other idea I have is that we use Spanish Moss in the upper portion of the aviary held in there by chicken wire. Could this be the cause of dust or any environmental problems. My husband designed and constructed this aviary three years ago and we really haven't experienced any problems until the past six months or so. Any additional ideas, and thank you for your first resonse. Michele Smykle from South Dakota asks: My pet sparrow who is 8 months old is loosing her feathers? They are not necessarly being "plucked" out either, they are falling off her when she flys, sits around etc.....She eats normal and acts normal. This all started happening a day after she took a bath -- What are your suggestions? I am taking her to the vet tomorrow. Red Foster from DFW, TX area asks: I have a 5 1/2 year old blue and gold Macaw. It seems she has stopped preening her feathers. They are not long and sleek anymore. They appear to be ruffled on the edges. Could this be serious? Hello Red, THE ROUGH EDGES OF FEATHERS indicates a dry feather or mechanical abrasion (friction). If the edges are roughened in the area around the elbow it may be masturbation if he is a boy. Other wise it could be mites, lice or more likely dry feathers associated with a delayed or slow moult. Whatever the cause this bird will definitely benefit 100% from a programme of my health products and S76. Within 3 weeks there will be a noticeable change in feather quality. If you could get a photo now and one in 3 weeks to see the change I believe you will be pleasantly surprised. Lorie from Tampa, Fl. asks: Dear Sir, I was given a pair of Zebra Finches only two months ago. I have never had a bird as a pet, there-fore I am in the "live & learn" process of care-giving. I have searched the internet for information on how to do so, to no avail - until now ! I am so glad to have stumbled onto this web-site, but I am hoping that it's not to late. I love my animals dearly & am fearful for my male. I had not noticed any problem before today, when I decided to do an extensive cleaning of their cage. (I normaly view them hanging from the ceiling) when I pulled the cage down and got a good look at the male I was terrified. He had no feathers on the top of his head. He looked as if he had been sucked through a vaccum cleaner. As I continued to examine him, he had feather loss on his back (only on one side) where his naked skin is very red & looks very sore. I took him out of the cage & discovered that the feather loss & redness continues all the way under his wing. It looks like it really hurts, & I am heartbroken & scared of what could be wrong. I can't believe that this could be normal, as in a moulting situation (although I am not completely educated about what that means). He acts totally fine. He is still able to fly pretty well, he is eating okay & he is as vocal as usual. His mate is her beautiful, normal self, but I have noticed her now picking at his raw areas (she acts like she knows something is wrong & she is trying to doctor him. He doesn't seem to mind her attention.) He picks at the remaining feathers in the affected area himself, as well. I put a heating pad against their cage in an attempt to keep his little naked body warm, & I put all new bedding in their nest. The female appears to be eggbound, because she has laid over a dozen eggs, since I got them, that have failed to produce anything. I was told she laid them due to stress from the move & that I should just remove them. I removed at least 9-10 eggs today before returning the pair to their cage. I am afraid to seperate the pair, & am afraid to keep them together. They have been (either) playing hard together alot the past few days, or else they are fighting. It's hard for me to distinguish between the two behaviors since I do not know them that well. All I know is that they do seem to love each other because they sleep together all the time & the male tends to this nest, that won't produce, religiously. I am very worried about them both. PLEASE, please! - I would appreciate any advice you can offer me to know how to take better care of these two & if my male has a (serious) problem that I need to address & if so, what do I do to help this poor little fellow. I don't want to fail at being a good birdy mom. Thank you so much for you time (& advice). Sincerely, A very worried mother. Betty from Portland, Oregon asks: Dr. Rob, I have a two year old female Lady Gouldian , that has a terrible problem. She has lost nearly all her feathers. She can barely perch on a perch 1 inch from the bottom of the cage. Her appetite is good, she is drinking well, and she of course stays close to her light for warmth. The male she has lived with for her whole life (and the father of her four beautiful boys) is fine, as beautiful as ever. I am worried about our little girl. I have been giving her Nekton MSA minerals and trace elements in her water, but I don't know what else I can do for her. Shelley from Washington asks: I have 1 female gouldian with 3 males; the female shows signs of aggressiveness towards the males. She is developing some bald spots which began as a bare ring around one eye, then patch of baldness on her cheek, now there is more baldness on the back of her head. What is causing this? I do not see the males picking at her or bothering her in the least, she's the one who bothers them. JP Agrall from Illinois asks: I have a 3 year old Quaker. 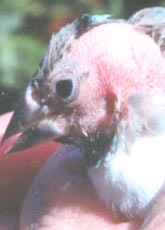 His feathers around the neck region, especially under his front neck region, are either falling out or being pulled out. What can I do to bring his condition back? He is bald on his neck. Thanks! J.P.
Courtney from Australia asks: A couple of months ago my female Gouldian started to bald on her head. I increased the iodine in her diet, this didn't seem to help. Over the last few weeks she has gotten worst, she has lost more feathers on her head and body. I took her to the vet and was given some cream called canaural. This made her feathers stick together. Yesterday the vet washed her, now she cannot fly and is hopping around the bottom of the cage. She is eating and drinking, but she is shaking and seems to be getting worst each day. What should I do?